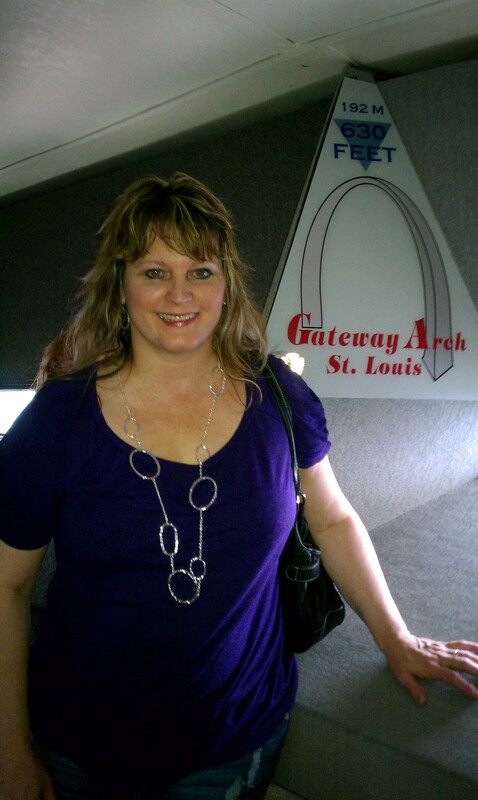 Me at the top of the arch – 630 feet tall! This weekend my family and I traveled to St. Louis, MO, to go on the “Journey to the Top” of the Saint Louis arch. Here are 5 life tips from the St. Louis Arch that I learned and want to share with you. You can also see the video I made today about these 5 tips here. 1. Go The Distance. We had to drive 4 1/2 hours from Kansas City to Saint Louis. To see someplace new, to accomplish new things, you have to get moving or you are going to be stuck in the same place. You have to take action and you have to persevere and refuse to quit. You have to go the distance if you are married; marriage is hard work. You have to go the distance if you’re a parent, growing in love, wisdom, and patience. You have to go the distance in your health, eating good foods, drinking lots of water, and exercising. You have to go the distance in your business, doing what it takes to succeed with vision, hard work, and persistence. Life is a marathon, not a sprint. Go the distance. 2. There’s going to be a little rain. We have had a severe drought here in Missouri for the last several months. It’s been terrible! The grass has withered and is yellow and brittle, the leaves are dying and falling off the trees. But on the way to St. Louis, it rained cats and dogs! We had to slow down, and couldn’t go as fast as we wanted, arriving late at night. I’m like a racehorse rarin’ to go, and God often teaches me patience by things happening slower than I’d like. (It seems to me that God is VERY slow!) But even with the “rain” in life, you don’t completely stop. You keep driving. The rain made it hard to see out the windshield sometimes. We’re going to face obstacles and distractions in our life sometimes, that makes our vision a little blurry, but keep driving. Don’t quit. Don’t let the rain in life – obstacles, distractions, stress – stop you from your destination. 3. There’s a price. We had to spend money to go on this trip. We had to pay for our hotel room at the Crowne Plaza Hotel at the Arch, pay the ticket fees to go up to the top of the arch, and pay for the delicious Italian food at Zia’s Italian restaurant where we ate lunch. There’s a price for the anointing of God on your life; it’s called obedience. Because of the anointing and high calling on your life, you’ll be misunderstood at times. You’ll face criticism and be judged. It can be a lonely walk. But God promises that He will never leave or forsake you. Follow Jesus! There is a price for a successful business; it requires a big learning curve, hard work, and developing strong people skills. There’s a price for a good marriage and parenting well. You need to be loving, forgiving, and unselfish. There’s a price for being single; it’s loneliness. There’s a price to pay for the important things in life. 4. Take a risk and be brave. To get to the top of the arch, you have to wait in line first and then go into a tiny capsule on the tram. You have to face and overcome feelings of claustrophobia or especially a fear of heights. The ride going up is a little bumpy and scary. There’s a risk the tram might get stuck or the arch could collapse. But it’s worth all the risks when you get to the top of the arch. You have to take risks and be courageous to have a successful business. If your dream is to be married, you have to take a risk saying “I do” to that man or woman who might wind up breaking your heart. If you desire to have children, you need courage and strength during labor and delivery of that precious, little baby. If you want your life to be different and happier, you have to take risks and be brave. 5. Enjoy the view. Once you get to the top of the St. Louis arch, the view is incredible on a clear day. You can see for miles. You see the skyscraper buildings, the football stadium, the Historic Old Courthouse, the beautiful church, the river, the cute little chugboats. While you’re on the ground, you have a limited view. When you go to the top, you get a different, much bigger perspective. Go higher in your walk with God; obey Him. Go higher in your marriage; strengthen and work on it. Go higher in parenting; develop a closer relationship with your children. Go higher in your business; take risks, learn more, step out in faith. Most of all, enjoy the view. Enjoy your life; do things to be happy. Enjoy the blessings God has given you every day and be thankful. Enjoy your life and have fun. Take time out to relax and do new things. Go new places. Meet new people. Live a full life; really live and enjoy your life. These are 5 life tips from the St. Louis arch. I hope you’ve enjoyed them and they were helpful to you. I’d love to know what you think. Please leave your comments below. Beth Jones is a Christian speaker, author, life coach, wife, and mom of 3 beautiful daughters. She resides in Kansas City, MO. Her mission is equipping women to hear God’s voice, unlock their gifts, and pursue their passion. You can find out more about Beth’s products, services, and events at www.BethJones.net.